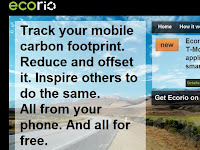 Ecorio utilizes the GPS system on the phone to track your carbon footprint as you travel. It calculates what kind of impact you make on the move, and gives you what kind of footprint you're making right then, and what kind of footprint you may make annually if your habits stay consistent. Once you see what your footprint looks like, the application then gives you ideas for taking action through reducing heavy impact travel, inspiring you to try greener options, or by purchasing carbon offsets through Google Checkout. You simply click on the field "What if I...." and by selecting an option, you can see by how much you're able to reduce your footprint right then. A free iPhone app from 3rdWhale is bent on making your shopping trips easier and greener. You can search for the greenest businesses near you so that you know just which stores to patronize. Over 20,000 business listings for over 30 major cities in Canada and the US are already hooked in to the app, with more being listed every day. 3rdWhale finds green businesses for its listings by going through directories that certify and accredit green products and services, then comparing them to their own green criteria to see if the businesses make the 3rdWhale cut. If they do, they're added into 3rdWhale's directory. But they're also very dependent on users to visit and review the businesses to make sure they're up to snuff. Think of it like a green Yelp on your phone. GreenMeter tracks your vehicle's fuel and power efficiency, but it also helps to evaluate how you're driving to maximize that efficiency. Adjusting driving habits helps cut cost, consumption, and carbon footprint. And this app has some cool tricks for helping you track habits. GreenMeter measures acceleration and computes engine power, fuel efficiency and cost, your carbon footprint and how many barrels of oil you're consuming. You don't even have to be driving to learn how to drive better. You can tip your iPhone forward and backward to simulate your acceleration, learn what the app teaches about that driving habit, and implement what you've learned next time you're behind the wheel. The coolest part of GreenMeter is that a user can be very specific about driving conditions to get the most accurate information about driving habits, inputing the specific vehicle make and model, weather conditions, and fuel type. This cool app hooks you up to a social network of folks who want to share rides. With this app, you can plug in where you're going and find others in your social network who are headed in the same direction. You can hitch a ride with them, or open up your vehicle to share a ride. While limited right now to the small number of users, it is growing and will hopefully soon be a catch-all for ridesharing. GoodGuide is a growing database of detailed product information that helps users make informed decisions about what they're buying. There may be 14 different toothpastes to choose from, including those that tout a green make-up, but do we really know what's behind each one? GoodGuide gathers detailed information about products and ranks them according to their greenness. Think: Greenpeace's Guide for electronics, only much bigger and for every day things. While not yet comprehensive, GoodGuide is rapidly growing, and they will soon offer an iPhone app so that you can quickly look up what option is the greenest, helping you make informed decisions you can feel good about. PedNav makes getting around the city easy and efficient, which means walking or biking can be faster and more convenient than using a vehicle. Just plug in your plans for the day, such as stores you need to get to, lunch dates, the notion to go see a movie or visit a museum. PedNav has the locations and schedules of the relevant venues at hand, and will create a personalized itinerary, including mass transit options if you'd prefer using that. Your instructions will include when you have to get to a certain bus stop, where to get off, how to get to the venue, and when you need to finish up your tasks at that location in order to get to your next event. With such convenience for planning, getting around town without driving is simple! The Locavore app is a great solution for someone who wants to switch to local eating and doesn't want to spend an hour on the computer researching food each time they want to make a meal. It offers government and NGO data for each state, and when you click on a food item, it brings up Wikipedia information and Epicurious recipes. It lacks a market-finder feature specific to in-season foods, but even with out this, the app sure beats printing out a list of in-season foods to cart with you to a farmer's market, spending way too much time online figuring out what to do with the food that is in season, and getting frustrated that you can't keep straight which farmer's market is on which date. Thanks for including 3rdWhale. A few things to know: It now includes 65,000 listings, the largest green business directory in North America. There's now also Creative Solutions, which are crowdsourced and benefit quantified sustainable living tips. Coming soon there will be a News section, with Mother Nature Network, CSRWire, and Eco Matters (news w/actions for you to do in relation to it) It's $1.99, of which 25 cents goes to 5 environmental NGOs, 3 of which our users chose.